Hi everyone! It is Monday again and a new week has begun. It was very dark here this morning, but now the sky has started to clear up a little. 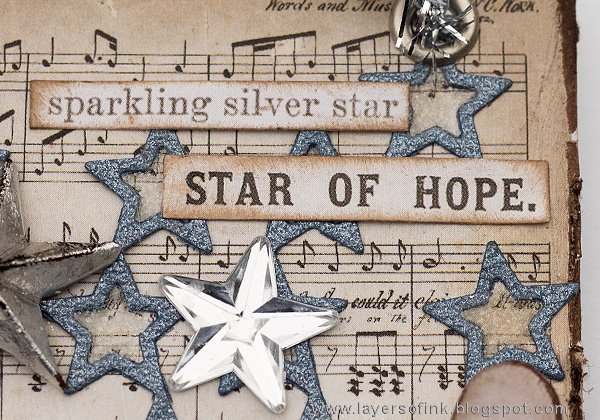 We have a Star Light Star Bright theme at the Simon Says Stamp Monday Challenge this week. Stars are really versatile and work for a wide range of themes, and you might have noticed that I like to use stars on projects. They also brighten up a dark night. I hope you will join us in this week's challenge, and don't miss the last project by our November guest designer, Suman Pandit. When I was thinking of what to do for this challenge, my eye fell on the music Christmas baseboard by Tim Holtz and I decided to work on that. This can either be a small wall-hanger, or it can go into a Christmas tree. I think I am going to hang in our tree. There are three different types of stars here, as well as some really nice sentiments about stars. I wanted it to look like each of the kids had their own star. I am sorry that there aren't any step photos this week, I was in a bit of a rush and ended up doing this project in bits and pieces of time. I sanded and scratched the edges of the base board, and then inked with Ground Espresso. The Christmas Clippings stickers were also inked. 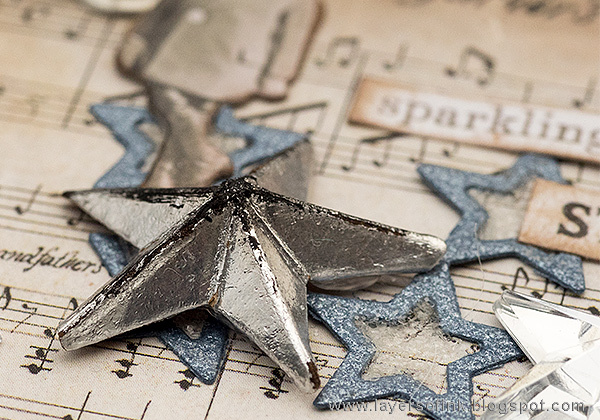 The blue stars were die cut with the SSS Stacked Stars die from their lovely Glimmery Paper. 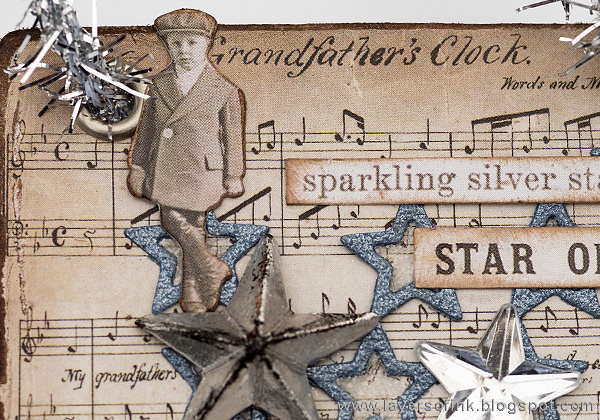 The silver stars were all die cut with Tim Holtz Sizzix Dimensional Stars die. It helps having a bone folder tool at hand when you fold the stars, to get nice crisp folding lines. I sanded the edges and used Black Soot paint to distress them a little. 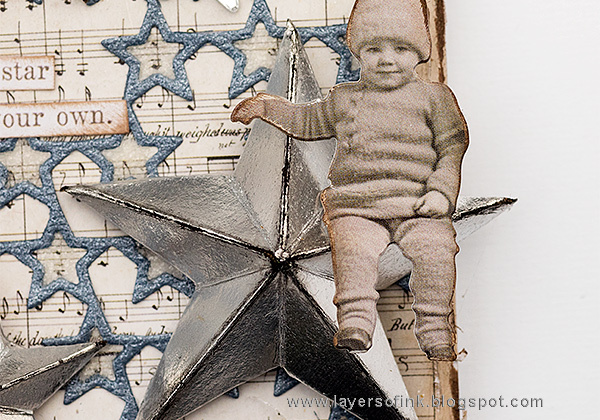 This baby image is one of my favourites from the Christmas Paper Dolls. I folded the legs a little so that is really looks like the baby is sitting on the star. On this star, you'll find a boy on his way to do some ice skating. And on the smallest star, there is another little boy. I made holes in the base board with my Crop-a-dile, set them with eyelets and tied with tinsel twine. The stars give a great dimensional effect to the project. Here's a close-up on the distressing on the star. First, I used Ground Espresso ink, but I wanted more of an effect and Black Soot paint worked great. My favorite part of this project is the center of the Stacked Stars. I applied Glossy Accents to the center of each star and then covered with Rock Candy dry glitter. 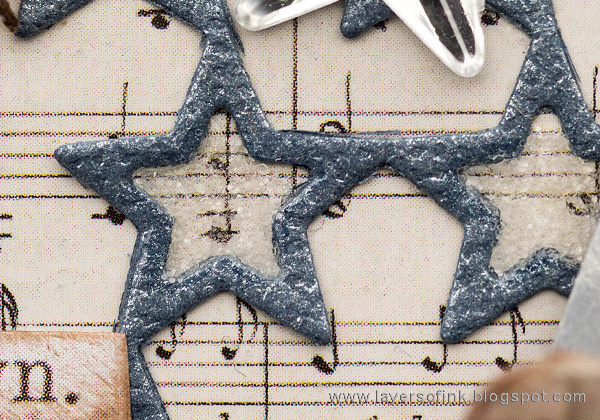 I love that you can still see the music notes, but under the layer of glitter and gloss. The board was finished with a Christmas Word Band, tied with a string of blue twine. White paint was rubbed into the word and I used black paint to distress it a bit. 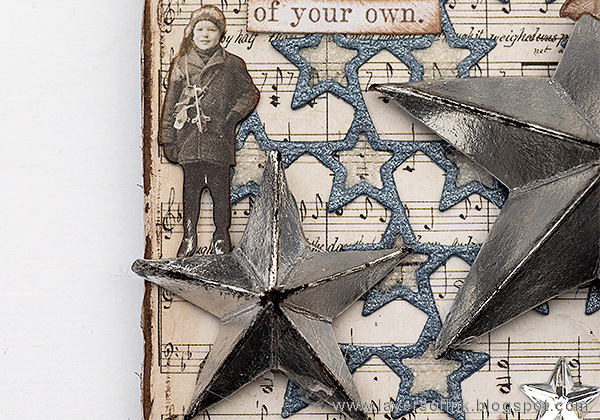 I also added three Mirrored Stars to the project. 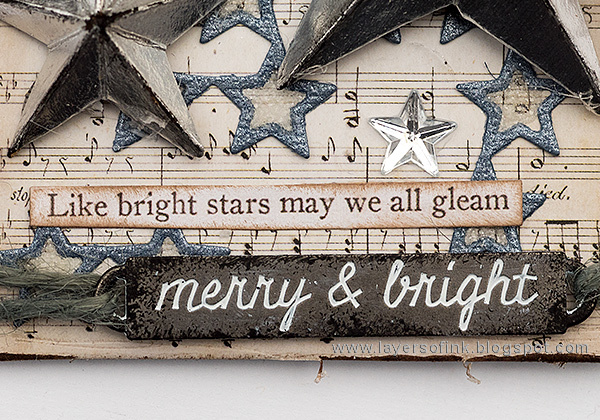 I hope you will join us this week in our Star Light Star Bright challenge. As always, you have a chance to win a $50 gift voucher to do some fun shopping at Simon Says Stamp. You have until Monday 8am Ohio time. 1pm UK time, 2 pm CET to join in. 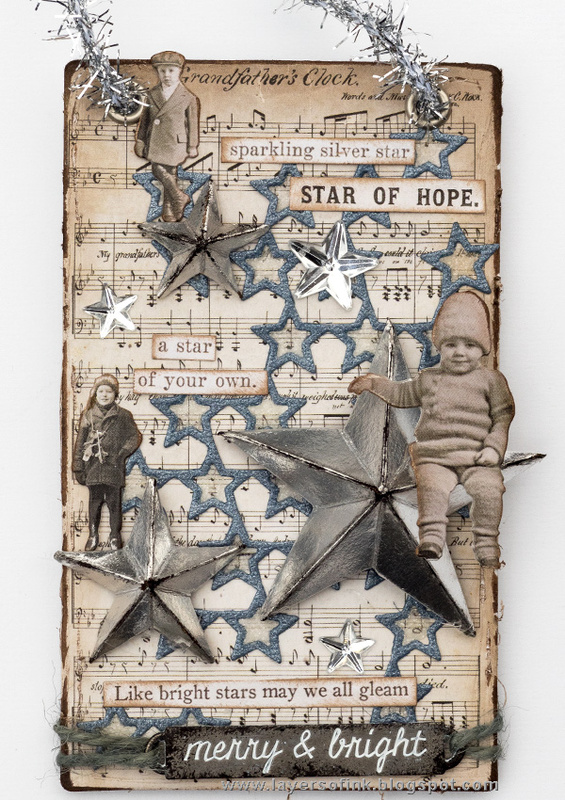 Hi Anna,absolutely adore this wonderful Christmas hanger, esp the cute boy sitting on the star...so clever, love the vintage palette too !! Thank you so so much for all your lovely comments on my blog, big hugs !!! I love this, Anna-Karin. All the little details and those cute little boys make this so adorable. 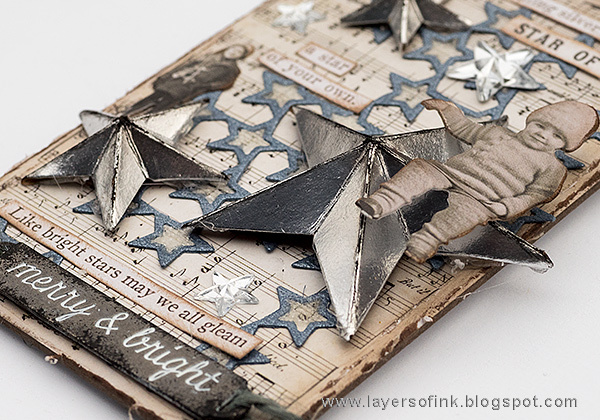 I love the distressed stars and the way you used glossy with the clear dry glitter. Lovely wall hanging with stars and children. 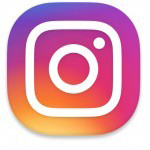 I like the neutral background, too. I love the vintage lok and feel to this decor piece. Another hit Anna-Karin. I love the vintage look to this Holiday tag. The stars are beautiful. The way you did those dimensional stars is incredible! I admire the way you are always showcasing new ideas and techniques. Thank you for the steady flow of inspiration! I love this color combo! The silver stars are awesome!